There is nobody more sharp and biting than an ex-friend, as Narendra Modi must have realized on Wednesday when Tamil Nadu CM Jayalalithaa took him to task on the question of development of his state. Modi and BJP have been claiming that Gujarat has shown peerless development that makes it a model worth adopting by the whole country. But Jayalalithaa said Modi needs to check his facts because TN has developed far better on a host of fronts. Is Jayalalithaa’s claim valid? 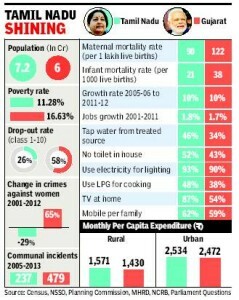 TOI did a quick study of some key indicators of both states and found that on most counts TN does perform better. Both are fairly ‘advanced’ states compared to others, both have an industrial base, both have higher levels of urbanization and both have been ruled by non-Congress parties for a considerable period. So, it’s not apples and oranges being compared. TN is, of course, much bigger than Gujarat in terms of population. Yet the number of people below poverty line is 102 lakh in Gujarat (about 17% of its population) compared to 82 lakh poor in TN (11%). Both states had an economic growth rate of about 10% between 2005-06 and 2011-12. Employment growth, adjusted to population growth, between 2001 and 2011 was nearly the same in both states. Yet, monthly expenditure by households, which is a measure of family incomes, is higher in TN than in Gujarat in both rural and urban areas. It is in the health and education sectors that the difference in quality of life really shows up. Dropout rates, that is the proportion of students dropping out of school compared to those enrolled at the beginning, are shockingly high in Gujarat at 58% for classes 1 to 10. In TN, it is 26% — still high, but less than half of Gujarat. On two key measures of health of people — infant deaths and mother’s deaths due to pregnancy complications — TN is ahead of Gujarat. A slew of indicators from the 2011 Census shows that people in TN have better access to treated tap water, electricity for lighting up homes, and LPG for cooking. But, Gujarat has more households with toilets in the house. Even TV and mobile ownership is more in TN. 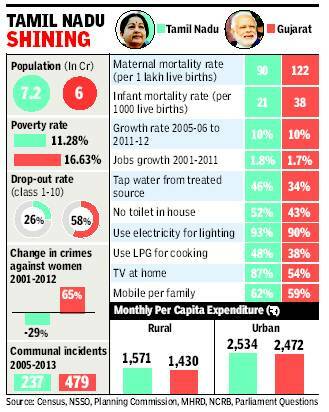 Two other bits of data show different yet equally important aspects of life in the two states. One is safety of women as measured by the number of registered cases of crimes against women. The second is incidents of communal violence. Between 2005 and 2013, Tamil Nadu witnessed 237 such incidents while Gujarat, despite repeated claims of communal amity by Modi, suffered through 479 incidents.